Define your lips with RMK Face Pop Lips, a rich, smooth lipstick with subtle shimmer finish. Available in a range of neutral tones, the lipstick contains delicate pearl particles that help to create a smoother, full-looking pout. 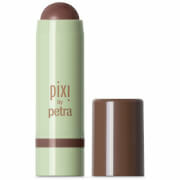 Gliding effortlessly across lips, it delivers a shock of rich colour to complement your natural lip shape and skin tone.